What do I mean when I refer to us as a Zero Garbage Family? To me, being zero garbage means being conscience of the waste that we produce and finding ways to dispose of that waste so that nothing goes into a landfill. It’s the understanding that everything that comes into your home eventually has to leave your home and thinking responsibly about how things will be disposed of. I cannot tell you the last time my husband or I threw something into a dumpster. I think, and this is a best guess, that the last time we put something in a dumpster destined for a landfill was sometime in the fall of 2013. So let’s just say we’ve been zero waste for four, almost five years now. And since March of 2010, I probably put only four small bags of garbage destined for a landfill per year. We essentially went on a journey around early 2010, to try to greatly reduce our garbage. It took us several years to figure out the best ways to dispose of things so they wouldn’t end up in a landfill. Our journey went from one to two bags of garbage per week, down to one to two bags of garbage a month, down to a few a year, until we were able to become truly zero garbage. Here is the part that might surprise you the most…. It’s not that terribly difficult. Our kids have always lived in a zero garbage home, and I don’t think they feel they live any differently than any other kids. If you came into our home, you probably wouldn’t even realize that we were living zero waste until you asked where the garbage was. So many times guests ask, “Where’s your garbage?” to which I usually answer, “Well, what is it exactly that you want to throw away?” The reason I bring this up is that given the desire, you could easily become zero waste, or extremely close to it. Within weeks, with a few small tweaks to the products you buy/use, you would be surprised to see how quickly you could get down to one or two bags per month. And it’s only then a short journey to get you completely zero-waste. Trust me. Before I explain our “magic secret” to being zero garbage, you are probably asking, why? Why do you care to do this? This could require some work and a change in our habits, so what is your motivation? Obviously, a huge motivation is environmental. Our hope is that being zero garbage will help reduce our global footprint. I could no longer accept the idea that I could put all my waste in a plastic bag and send it off to be buried on someone’s land, or worse dumped into the sea. Garbage is a hazard to our planet, and I wanted to see if I could stop being a polluter. Another motivator was money. There was an assumption that living this way could actually save us a lot of money, which was extremely important as we started a family. We were also motivated by the desire to consume less, to be conscious of what we were purchasing and to understand how our purchases were affecting the planet. Here are some staggering numbers that we just couldn’t ignore…..
• The average American throws away more than 4 pounds of garbage each day. • Only 9.5% of all plastic in the United States is recycled. 15% is burned for electricity or heat. • About one third of our recycling is exported, where it is often buried in a landfill. • Buried plastic will take about 500 years to breakdown. • 8.8 million tons of garbage enters our oceans each year. So truly, a lot of my motivation is just personal guilt. I feel guilty that what I purchase can be harming my planet. I feel guilty being a consumer. To consume means to “destroy or expend by use, or to spend wastefully”. I no longer want what I consume to destroy our planet. Thus began our journey. So how do we do it? ?!! I said it wasn’t that terribly hard, and it’s not. There are three main ways that we dispose of our daily trash, which is mostly food waste and packaging waste. Our food waste we compost. Our packaging waste we either recycle, or put into our TerraCycle box. That’s it. Simple. I guess there is a fourth step…. We often choose not to buy certain products at all. Composting…… all our food waste (egg shells, banana peels, tea bags) and brown waste (toilet paper rolls, compostable paper cups, leaves) gets put into a giant bucket. Once that bucket is full, we add our compost to that of our condo residents. Twice a month this gets picked up by a composting service. Because we live in the city, we can’t have a large compost pile in our yard (we don’t even have a yard), or we would attract all sorts of scary varmints. For years, we kept an indoor composting bin and we had about 5,000 worms that would eat our food scraps and turn it into compost. But now we compost as a condo building. For a very small fee, our food scraps are hauled away to a commercial composting site. Recycling…. We put any packaging we can recycle into our recycling bin. Tin cans, cereal boxes, plastic containers with the recycling triangle, get placed in our recycling bin. However, considering how non-transparent recycling programs can be, we don’t really trust what is happening to our recycling. So we really feel at war with packaging. So I try to purchase things in packaging that I know can be easily recycled, such as tin cans, and less around plastic centered packaging. TerryCycle box….. What? What is this? We use our TerraCycle box for all those pesky things that we can’t compost or recycle, such as the plastic wrapper around cheese or the cereal bag within the cardboard box. TerraCycle then takes this kind of waste and turns it into park benches, backpacks, etc. We pay about $100 per large box and try to limit the amount we send each year to one or two. I am at war with food packaging and TerraCycle helps me win that war, though I do have to pay for it. My kids are a huge driver in what goes into our box, and often times it is not products we purchase but instead things they are given outside our home that we eventually have to dispose of. Learn more about TerraCycle here. Do not buy…. There are just a bunch of things I don’t buy, either because I can’t compost it or recycle it, or I find the product extremely wasteful. Remember when I said this lifestyle saves us a ton of money. This is where the cash really adds up. Here a list of things that most people buy weekly or monthly that I do not purchase at all. • Paper products…paper towels, napkins, Kleenex, paper plates/cups. We use cloth rags for cleaning, cloth napkins for eating and cloth handkerchiefs for our noses. Since most of our cloth was purchased at resale shops, like Salvation Army, I am not devastated if they get a bit stained. I keep a set of nice towels and napkins, and the rest for daily clean-up. If you want to make an easy change that is going to make a big difference in your pocket book, start with your paper products! This is a great first step on your zero-waste journey. • Diapers. We got through two kids going completely cloth. We spent about $800 on the investment. The estimates vary, but per kid a parent will spend about $6,000 on diapers by the time the kid is toilet trained. So we saved over $10,000 by cloth diapering and several tons of diaper waste from a landfill. A total win-win. • Hazardous Cleaning Products. I honestly think I am still using the same bottle of Windex left by the previous condo owners back in 2013. Other than this bottle of Windex, we clean with vinegar, lemons, or baking soda. You really don’t need more than that. • Ridiculously stupid plastic. GoGurts. Juice boxes. Squeeze food pouches. Individually packaged string cheese. There are a lot of things I do to make grocery shopping easier, in order to win my battle against packaging. First I make a grocery list so that I am not making needless purchases. I try to buy in bulk as much as I can. And when I say “buy in bulk”, I do not mean Costco bulk, which is often a lot of individually packaged items sold in a group. What I mean is buying large quantities of products that I put in my own containers. I often bring my own Tupperware when I purchase meat. Even though TerraCycle will take the plastic wrap or brown paper that meat is wrapped in, most grocery stores will put your meat into Tupperware for you. I present the butcher with my Tupperware; they zero out the weight and then add my meat. It’s simple, and no waste. Being zero garbage works for our family. We probably do a million more things to reduce our garbage than what I’ve written about here. But they are habit. They are as easy as breathing. I truly had to wrack my brain to think how we did it, since so much of this is now second nature. I can truly not remember my life before. Until I go into other people’s houses and am often shocked by what’s in their garbage, I don’t even think about our garbage habits anymore. And honestly, if you chose to live this way, you would soon feel the same. Just like with a diet, or attempting any new habit, you start with a bit at a time. A few small changes regarding what you buy and how you dispose of that product will make a huge difference. It’s about making you more conscious of what you consume and then how you dispose of it. 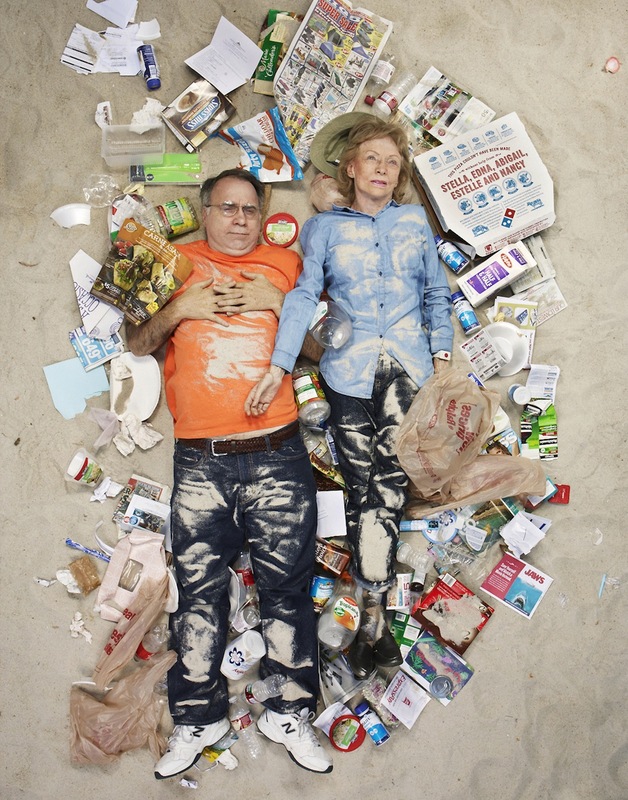 Gregg Segal has created an amazing group of photographs of families who are lying amid the garbage that they have created within a week. I find these photographs very moving. What would your family photo look like? How would looking at it make you feel? You might find you learn a great deal about yourself when you look at what you throw away. Gosh, I recycle too …. not zero…but still almost cant stand to be in places where they DONT recycle…I find it very hard not to just take their garbage and sort thru it and show them…well actually, I did that…..they could have cared less, unfortunately! This is incredibly convicting…. and also so needed!!! Thanks for sharing!